Ji-Hoo (Han Seung-Yeon) holds painful memories from her first love. She now has a secret crush on co-worker Tae-Soo (Hong Jong-Hyun). Tae-Soo does not believe in love, but by some incident Tae-Soo becomes interested in her. Based on the webcomic "Her Lovely Heels" by Park Yoon-Young (published from September, 2010 to May, 2011 via nate webtoon). Angel Zhou Nov 24 2018 4:23 am The love story seems so real and truthfully very relatable for me. How many of us like and continue liking the same person since the first encounter? How many of us like a person but not confident enough to embrace him/her thinking that we may be the one that hurt him/her? This series describes it all; how a romance relationship that involves commitment might not always happen as smoothly as in other k-dramas where everyone seems so ensured about whom they like and they never hesitate even once. This series, Her Lovely Heels, is soooo reaaal. Everyone hesitates, yet loves. kdrama daebak sakon Dec 31 2015 8:26 am If you a fan of both leads or first time seeing kdrama you might get hooked because the love scene is what everyone imagining to be and i dont believe this what happen in real life like some thinks it is. Its good to see they work hard to express the emotion but the story line and how they potrayed the love scene are almost like compilation of love scene in typical kdrama. Strangely, I kept thinking of yura everytime i saw scene of hong jong hyun. Sabrina Jun 21 2015 1:04 am I just watched this drama. I love the story. It kind of ordinary love story which really happens in real life. I feel connected with tae soo and ji hoo. I love them both. Clumsy ji hoo and cool tae soo who fall in love and thingking too much about where they would bring their love etc etc. I love the casts. 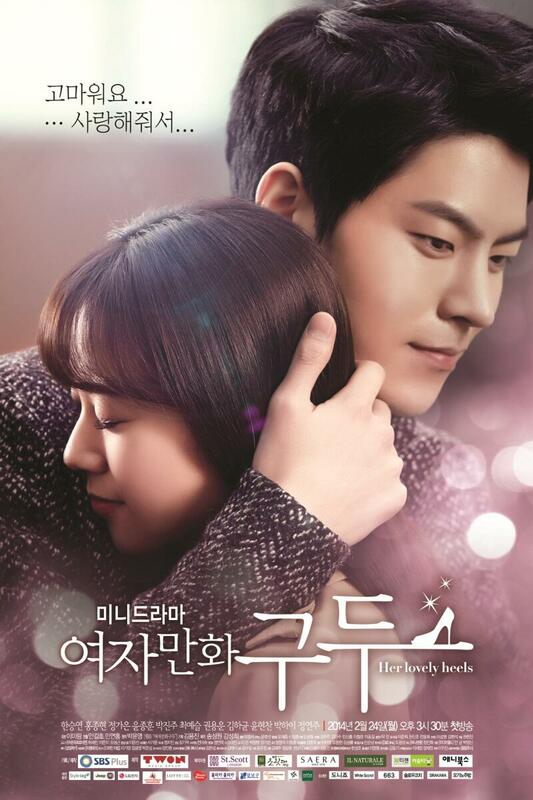 It is my first time watching hong jong hyun played as a main actor. I love him. Fighting hong jong hyun keurigo han seung hyeon! Kalixia Jan 02 2015 5:59 pm The very first Korean drama I have watched, and I'm hooked. I love it. I watched it on a flight coming from Taiwan and fell in love. The story is so cute and the way the movie is shot makes it very romantic. Thank you Korean actors. Very good acting. I wish I understood Korean but I was happy with English subtitles anyhow. My best wishes. Hope to watch more like this in the future. Jaf Jan 02 2015 1:42 am I mean throughout the year of 2014 I saw many different Kdramas and most of them were really good; however I think this drama was a really good way to finish and start a new year because of how cute and simple it was. Although it was not the best of all dramas I personally recommend it, If you are looking for a cute short romantic drama. Thank you to the actors and I hope to see you in many more dramas during 2015! FIGHTING!!! A Nov 26 2014 3:42 am Bad acting, bad plot, don't bother watching. unless you are her fan. mylene grande Nov 05 2014 5:12 am the ugliest korean drama. JJ Sep 19 2014 5:35 pm Short and sweet. I'm really impressed with Seung Yeon's acting. She is so cute. I recommend everyone watch Seung Yeon mini drama Secret Love. Her acting was superb. It also has a really lovely storyline. Anyways, I watched this all in one sitting. Love it. Vilnya Jul 01 2014 1:20 am This drama is so cutee >-< Love it!! images of hobart tasmania May 16 2014 6:19 am If you are not technically inclined you might want to move around it or at least get guidance from one of the specialists in the shop where you decide to purchase it. If you haven't yet thought of this gifting option, then do so now. It shows how much you care and all the extra efforts that you are willing to take, to gift something unique to your beloved. kai Apr 30 2014 5:19 am Watched half and get bored.. so lame, classic, and no fun. Absolutely Korean drama, in past. The only thing if i continued the drama is.. their beautiful shoes. Ravy Apr 14 2014 9:46 am I'm in love with this drama head over heel now. 10 out of 10 for this drama. clara Apr 02 2014 2:52 am I give this drama a 10/10 .it was so good and so romantic, nothing I didn't like about it . There is no way she is gonna run away with those shoes he even engraved the words "I love you" so that she will never forget and never have to ask again whether he truly loves her . kristbjorg999 Mar 21 2014 3:18 pm Agree with all the others, this show is GREAT, too bad it is so short each episode. Also I really want to read the webtoon, where can I find it? heartexo Mar 17 2014 8:43 am Where can i read this webtoon???? I REALLY want to read the webtoon too but i can't find it anywhere online??? Suggestions? Angel Mar 14 2014 9:50 am This show is very cute yet veeery short T_T!!! why?!! Both main characters look good together!!! <3 <3 I want more kinds of this show!!! Tima Mar 10 2014 10:40 am I love this show. The storyline is simple yet the acting full of emotion. lilly Mar 07 2014 2:21 am so incredibly cute!!!!!!!!!!! Linna Mar 03 2014 12:46 pm At the first time I was thinking that the first episode is not complete, but then I understood that these are miniseries.Anyway, I like this minidrama, I would like that a episode be longer than 30min. It's a interesting love story, about teens I would say. Actors,also are very very cute. Ahh... I can't wait for the next episodes. :) Fighting,guys! Gunshot Feb 28 2014 1:48 am first time,i know that man in Jungle Fish 2. it has been 4 years, but his face still look same. lol.